There are a lot of pitchers out there who could better there stats and performance with some valuable information about what to throw and when to throw it. 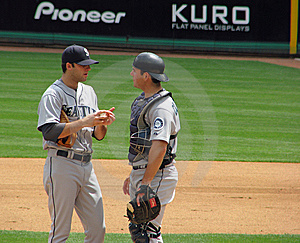 Catchers and Pitchers need to work with their coaches about these tips of situational pitching. Keep the ball low in double-play situations. Pitch high, tight fast balls in bunt situations. Try to keep the ball down when the infield is in or an important run is on third. Keep the ball away from the pull hitters, especially in a small park. Try to prevent a left-handed hitter from pulling.the ball whenever the first baseman is holding a runner close. With a runner on second and no outs, try to make the hitter ground to the left side to prevent the runner from going to third. A curve ball usually breaks better on a damp day. A fast ball usually is more effective on a dark or cloudy day. A new ball doesn’t curve as well as one which has been in the game awhile. A new ball usually makes the fast ball more lively.